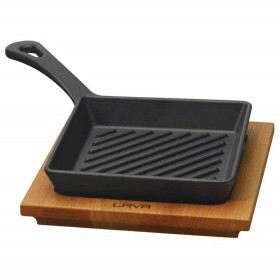 Every product from Lava is unique and hand made by skilled craftsmen who have generations of experience with cast iron. Because Lava products are handmade, there are slight variations that give that wonderful, authentic feel. The natural heat retention and redistribution of cast iron is something chefs and foodies have taken advantage of for centuries. Lava products can be used on all types of heat sources - gass, electric, induction, oven, ceramic, or over an open fire. 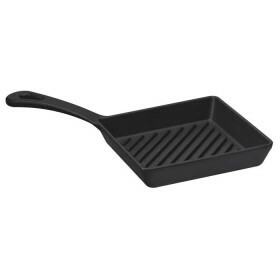 The cast iron is entirely lead free and non-toxic, tested and approved according to IPAC standards for food safety. Lava products can be washed by hand or in a dishwasher. Lava cast iron kitchenware16 x 16 cm square skilletEvery product from Lava is unique and hand made b..